Hitting The Reset Button At 61 And A Half. The company that kept me employed for the last 20 years has decided that the manufacturing wing where I was (note, was) a Sr. Electronic Test Tech should be moved to a State less hostile to profits. The regulatory attitude of California's state officials is legend. The question is, will they ever wake up and realize, despite their erudite wisdom, that they've shot themselves in the foot by undermining their tax base? Doesn't look like it. My crystal ball is fuzzy on the future time frame of the chaos ahead. Well, I could have moved with the company, which has turned out to have painted a slightly more rosy picture of what was in store for the dedicated in the newer location. That's to be expected, because it all boils down to leverage. If your knowledge is going to keep their contracts on track they will want to entice you to move to a place not quite as pleasant with some goodies that will entice you to go. After you decide, you're on your own because your frame of reference is completely different than those trying to entice you to go. So much of what we have we take for granted and a shift in perspective is easy from an armchair miles away. Once you get "there", you have to put a new frame of reference together from parts you've never seen before. That's why I opted to stick with the familiar and retire. 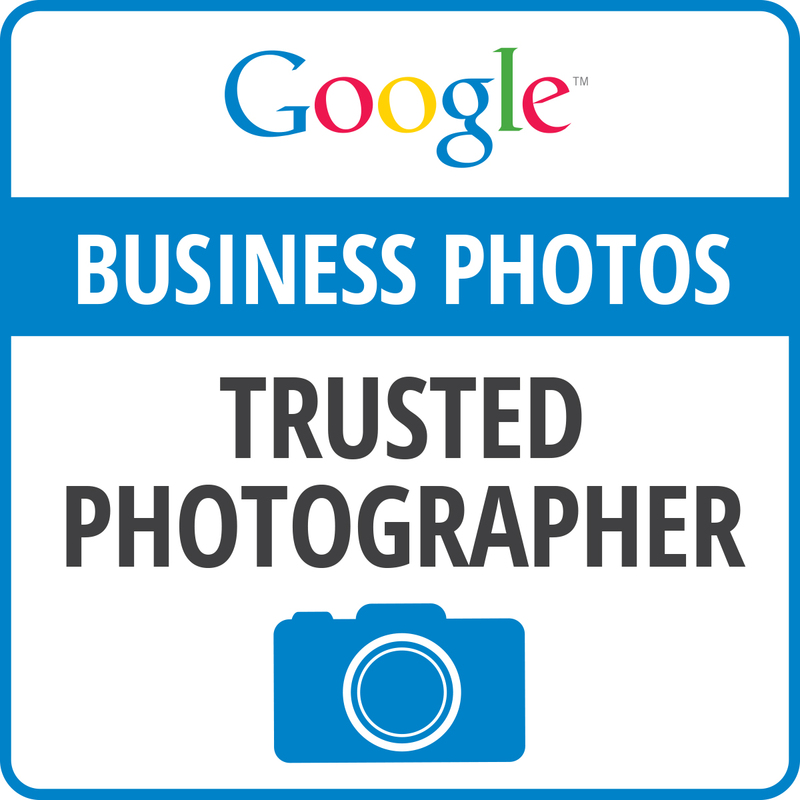 Well, as inflation takes big bites out of my retirement and as some one who is still young at heart, the right opportunity came along and now I'm on my way to become a Google Trusted Photographer for Businesses, click on my business; Show-Your-Business. I contract with businesses to put them on Google Maps and now I'm enthusiastic about the future once again! P.S. Check out Simone's, one of the businesses I shot. This is interactive, so you can click on your mouse while in the view to look beyond the present field of view. And now, for an added bonus, Oneonta Gorge brought to you by Tom Hayden, Google Business Photographer extraordinaire! The bubble house in france designed by Antti Lovag. Cooooool! We Live Here-Need I Say More? This was posted on Youtube in March of 2011. By now there are thousands more 3D printers most recently in people's homes. The implications are staggering. Prepare for a paradigm shift that will take a few years to gain steam. The greatest irony is that the manufacture of plastics, grouped with fossil fuels and the oil industry are on a downward course in the United States due to a very narrow utopian thrust disdaining any non-believers as ignorant dolts. There really are different opinions allowed in a free society, right? Am I asking the relentless self-ordained geniuses? The ones whose math states, Bush=Romney. The wave of the future? Umami has containment cages where they keep fish for sustainable farming. RoboKopter Zamieszki I has used a helicopter to record riots in Warsaw. Using helicopters with cameras is changing capabilities like never before. It is the best of times, it is the worst of times. This was not in past tense, so it is not the beginning of Charles Dicken's "A Tale Of Two Cities". We are truly in the process of a paradigm shift on Planet Earth. I don't know about you, but I have a very easy time talking myself out of doing sit-ups. This video got me moving because Jennifer advocates using very little in the way of equipment to keep it simple. Ultimately I know that just making a decision to start is all it takes to, well, start! Jennifer Cohen has written, “No Gym Required, Unleash Your Inner Rockstar”, a book that promotes back to basic exercises in your quest for fitness. Ms. Cohen says she realized over the years that the simple, old school movements were the ones that produced the best benefits, and that a gym membership isn’t needed to get fit. A popular phrase that accompanies her philosophy is “anytime, anywhere, all you have to do is decide”. In a video interview, she talks about how bodyweight and minimal equipment regimens produce better results than big bulky gym equipment which performs a lot of the work for you. The attitude reminded me of my primary motivation for running some time ago. I remember admiring the physiques of runners, when, shazam, I realized I could admire my own accomplishments while running myself! That shift in attitude changed my life then as did the attitude presented here. California Needs To Cut Libraries, Police And Fire Departments? California Bureau of Home Furnishings and Thermal Insulation * California Bureau of Naturopathic Medicine * California Bureau of Security and Investigative Services * California Bureau of State Audits * California Business Agency * California Bus iness Investment Services (CalBIS) * California Business Permit Information (CalGOLD) * California Business Portal * California Business, Transportation and Housing Agency * California Cal Grants * California CalJOBS * California Cal-Learn Program * California CalVet Home Loan Program * California Career Resource Network * California Cemetery and Funeral Bureau * California Center for Analytical Chemistry * California Center for Distributed Learning * California Center for Teaching Careers (Teach California) * California Chancellors Office * California Charter Schools * California Children and Families Commission * California Children and Family Services Division * California Citizens Compensation Commission * California Civil Rights Bureau * California Coastal Commission * California Coastal Conservancy * California Code of Regulations * California Collaborative Projects with UC Davis * California Commission for Jobs and Economic Growth * California Commission on Aging * Ca lifornia Commission on Health and Safety and Workers Compensation * California Commission on Judicial Performance * California Commission on State Mandates * California Commission on Status of Women * California Commission on Teacher Credentialing * California Commission on the Status of Women * California Committee on Dental Auxiliaries * California Community Colleges Chancellors Office, Junior Colleges * California Community Colleges Chancellors Office * California Complaint Mediation Program * California Conservation Corps * California Constitution Revision Commission * California Consumer Hotline * California Consumer Information Center * California Consumer Information * California Consumer Services Division * California Consumers and Families Agency * California Contractors State License Board * California Corrections Standards Authority * California Council for the Humanities * California Council on Criminal Justice * California Council on Developmental Disabilities * California Court Reporters Board * California Courts of Appeal * California Crime and Violence Prevention Center * California Criminal Justice Statistics Center * California Criminalist Institute Forensic Library * California CSGnet Network Management * California Cultural and Historical Endowment * California Cultural Resources Division * California Curriculum and Instructional Leadership Branch * California Data Exchange Center * California Data Management Division * California Debt and Investment Advisory Commission * California Delta Protection Commission * California Democratic Caucus * California Demographic Research Unit * California Dental Auxiliaries * California Department of Aging * California Department of Alcohol and Drug Programs * California Department of Alcoholic Beverage Control Appeals Board * California Department of Alcoholic Beverage Control * California Department of Boating and Waterways (Cal Boating) * California Department of Child Support Services (CDCSS) * California Department of Community Services and Development * California Department of Conservation * California Department of Consumer Affairs * California Department of Corporations * California Department of Corrections and Rehabilitation * California Department of Developmental Services * California Department of Education * California Department of Fair Employment and Housing * California Department of Finance * California Department of Financial Institutions * California Department of Fish and Game * California Department of Food and Agriculture * California Department of Forestry and Fire Protection (CDF) * California Department of General Services * California Department of General Services, Office of State Publishing * California Department of Health Care Services * California Department of Housing and Community Development * California Department of Industrial Relations (DIR) * California Department of Insurance * California Department of Justice Firearm s Division * California Department of Justice Opinion Unit * California Department of Justice, Consumer Information, Public Inquiry Unit * California Department of Justice * California Department of Managed Health Care * California Department of Mental Health * California Department of Motor Vehicles (DMV) * California Department of Personnel Administration * California Department of Pesticide Regulation * California Department of Public Health * California Department of Real Estate * California Department of Rehabilitation * California Department of Social Services Adoptions Branch * California Department of Social Services * California Department of Technology Services Training Center (DTSTC) * California Department of Technology Services (DTS) * California Department of Toxic Substances Control * California Department of Transportation (Caltrans) * California Department of Veterans Affairs (CalVets) * California Department of Water Resources * California Departmento de Ve hiculos Motorizados * California Digital Library * California Disabled Veteran Business Enterprise Certification Program * California Division of Apprenticeship Standards * California Division of Codes and Standards * California Division of Communicable Disease Control * California Division of Engineering * California Division of Environmental and Occupational Disease Control * California Division of Gambling Control * California Division of Housing Policy Development * California Division of Labor Standards Enforcement * California Division of Labor Statistics and Research * California Division of Land and Right of Way * California Division of Land Resource Protection * California Division of Law Enforcement General Library * California Division of Measurement Standards * California Division of Mines and Geology * California Division of Occupational Safety and Health (Cal/OSHA) * California Division of Oil, Gas and Geothermal Resources * California Division of Planning and Local Assistance * California Division of Recycling * California Division of Safety of Dams * California Division of the State Architect * California Division of Tourism * California Division of Workers Compensation Medical Unit * California Division of Workers Compensation * California Economic Assistance, Business and Community Resources * California Economic Strategy Panel * California Education and Training Agency * California Education Audit Appeals Panel * California Educational Facilities Authority * California Elections Division * California Electricity Oversight Board * California Emergency Management Agency * California Emergency Medical Services Authority * California Employment Development Department (EDD) * California Employment Information State Jobs * California Employment Training Panel * California Energy Commission * California Environment and Natural Resources Agency * California Environmental Protection Agency (Cal/EPA) * California Environmental Resource s Evaluation System (CERES) * California Executive Office * California Export Laboratory Services * California Exposition and State Fair (Cal Expo) * California Fair Political Practices Commission * California Fairs and Expositions Division * California Film Commission * California Fire and Resource Assessment Program * California Firearms Division * California Fiscal Services * California Fish and Game Commission * California Fisheries Program Branch * California Floodplain Management * California Foster Youth Help * California Franchise Tax Board (FTB) * California Fraud Division * California Gambling Control Commission * California Geographic Information Systems Council (GIS) * California Geological Survey * California Government Claims and Victim Compensation Board * California Governors Committee for Employment of Disabled Persons * California Governors Mentoring Partnership * California Governors Office of Emergency Services * California Governors Office of Homeland Se curity * California Governors Office of Planning and Research * California Governors Office * California Grant and Enterprise Zone Programs HCD Loan * California Health and Human Services Agency * California Health and Safety Agency * California Healthy Families Program * California Hearing Aid Dispensers Bureau * California High-Speed Rail Authority * California Highway Patrol (CHP) * California History and Culture Agency * California Horse Racing Board * California Housing Finance Agency * California Indoor Air Quality Program * California Industrial Development Financing Advisory Commission * California Industrial Welfare Commission * California InFoPeople * California Information Center for the Environment * California Infrastructure and Economic Development Bank (I-Bank) * California Inspection Services * California Institute for County Government * California Institute for Education Reform * California Integrated Waste Management Board* California Interagency Ecologic al Program * California Job Service * California Junta Estatal de Personal * California Labor and Employment Agency * California Labor and Workforce Development Agency * California Labor Market Information Division * California Land Use Planning Information Network (LUPIN) * California Lands Commission * California Landscape Architects Technical Committee * California Latino Legislative Caucus * California Law Enforcement Branch * California Law Enforcement General Library * California Law Revision Commission * California Legislative Analyst's Office * California Legislative Black Caucus * California Legislative Counsel * California Legislative Division * California Legislative Information * California Legislative Lesbian, Gay, Bisexual, and Transgender (LGBT) Caucus * California Legislature Internet Caucus * California Library De velopment Services * California License and Revenue Branch * California Major Risk Medical Insurance Program * California Managed Risk Medical Ins urance Board * California Maritime Academy * California Marketing Services * California Measurement Standards * California Medical Assistance Commission * California Medical Care Services * California Military Department * California Mining and Geology Board * California Museum for History, Women, and the Arts * California Museum Resource Center * California National Guard * California Native American Heritage Commission * California Natural Community Conservation Planning Program * California New Motor Vehicle Board * California Nursing Home Administrator Program * California Occupational Safety and Health Appeals Board * California Occupational Safety and Health Standards Board * California Ocean Resources Management Program * California Office of Administrative Hearings * California Office of Administrative Law * California Office of AIDS * California Office of Binational Border Health * California Office of Child Abuse Prevention * California Office of Deaf Access * Cali fornia Office of Emergency Services (OES) * California Office of Environmental Health Hazard Assessment * California Office of Fiscal Services * California Office of Fleet Administration * California Office of Health Insurance Portability and Accountability Act (HIPAA) Implementation (CalOHI) * California Office of Historic Preservation * California Office of Homeland Security * California Office of Human Resources * California Office of Legal Services * California Office of Legislation * California Office of Lieutenant Governor * California Office of Military and Aerospace Support * California Office of Mine Reclamation * California Office of Natural Resource Education * California Office of Privacy Protection * California Office of Public School Construction * California Office of Real Estate Appraisers * California Office of Risk and Insurance Management * California Office of Services to the Blind * California Office of Spill Prevention and Response * California Office o f State Publishing (OSP) * California Office of Statewide Health Planning and Development * California Office of Systems Integration * California Office of the Inspector General * California Office of the Ombudsman * California Office of the Patient Advocate * California Office of the President * California Office of the Secretary for Education * California Office of the State Fire Marshal * California Office of the State Public Defender * California Office of Traffic Safety * California Office of Vital Records * California Online Directory * California Operations Control Office * California Opinion Unit * California Outreach and Technical Assistance Network (OTAN) * California Park and Recreation Commission * California Peace Officer Standards and Training (POST) * California Performance Review (CPR) * California Permit Information for Business (CalGOLD) * California Physical Therapy Board * California Physician Assistant Committee * California Plant Health and Pest Prevent ion Services * California Policy and Evaluation Division * California Political Reform Division * California Pollution Control Financing Authority * California Polytechnic State University, San Luis Obispo * California Postsecondary Education Commission * California Prevention Services * California Primary Care and Family Health * California Prison Industry Authority * California Procurement Division * California Public Employees Retirement System (CalPERS) * California Public Employment Relations Board (PERB) * California Public Utilities Commission (PUC) * California Real Estate Services Division * California Refugee Programs Branch * California Regional Water Quality Control Boards * California Registered Veterinary Technician Committee * California Registrar of Charitable Trusts * California Republican Caucus * California Research and Development Division * California Research Bureau * California Resources Agency * California Respiratory Care Board * California Rivers As sessment * California Rural Health Policy Council * California Safe Schools * California San Francisco Bay Conservation and Development Commission * California San Gabriel and Lower Los Angeles Rivers and Mountains Conservancy * California San Joaquin River Conservancy * California School to Career * California Science Center * California Scripps Institution of Oceanography * California Secretary of State Business Portal * California Secretary of State * California Seismic Safety Commission * California Self Insurance Plans (SIP) * California Senate Office of Research * California Small Business and Disabled Veteran Business Enterprise Certification Program * California Small Business Development Center Program * California Smart Growth Caucus * California Smog Check Information Center * California Spatial Information Library * California Special Education Division * California Speech-Language Pathology and Audiology Board * California Standardized Testing and Reporting (STA R) * California Standards and Assessment Division * California State Administrative Manual (SAM) * California State Allocation Board * California State and Consumer Services Agency * California State Architect * California State Archives * California State Assembly * California State Association of Counties (CSAC) * California State Board of Education * California State Board of Food and Agriculture *California Office of the Chief Information Officer (OCIO) * California State Children's Trust Fund * California State Compensation Insurance Fund * California State Contracts Register Program * California State Contracts Register * California State Controller * California State Council on Developmental Disabilities (SCDD) * California State Disability Insurance (SDI) * California State Fair (Cal Expo) * California State Jobs Employment Information * California State Lands Commission * California State Legislative Portal * California State Legislature * California State Library C atalog * California State Library Services Bureau * California State Library * California State Lottery * California State Mediation and Conciliation Service * California State Mining and Geology Board * California State Park and Recreation Commission * California State Parks * California State Personnel Board * California State Polytechnic University, Pomona * California State Railroad Museum * California State Science Fair * California State Senate * California State Summer School for Mathematics and Science (COSMOS) * California State Summer School for the Arts * California State Superintendent of Public Instruction * California State Teachers Retirement System (CalSTRS) * California State Treasurer * California State University Center for Distributed Learning * California State University, Bakersfield * California State University, Channel Islands * California State University, Chico * California State University, Dominguez Hills * California State University, East Bay * California State University, Fresno * California State University, Fullerton * California State University, Long Beach * California State University, Los Angeles * California State University, Monterey Bay * California State University, Northridge * California State University, Sacramento * California State University, San Bernardino * California State University, San Marcos * California State University, Stanislaus * California State University (CSU) * California State Water Project Analysis Office * California State Water Project * California State Water Resources Control Board * California Structural Pest Control Board * California Student Aid Commission * California Superintendent of Public Instruction * California Superior Courts * California Tahoe Conservancy * California Task Force on Culturally and Linguistically Competent Physicians and Dentists * California Tax Information Center * California Technology and Administration Branch Finance * California Telecommunicat ions Division * California Telephone Medical Advice Services (TAMS) * California Transportation Commission * California Travel and Transportation Agency * California Unclaimed Property Program * California Unemployment Insurance Appeals Board * California Unemployment Insurance Program * California Uniform Construction Cost Accounting Commission * California Veterans Board * California Veterans Memorial * California Veterinary Medical Board and Registered Veterinary Technician Examining Committee * California Veterinary Medical Board * California Victim Compensation and Government Claims Board * California Volunteers * California Voter Registration * California Water Commission * California Water Environment Association (COWPEA) * California Water Resources Control Board * California Welfare to Work Division * California Wetlands Information System * California Wildlife and Habitat Data Analysis Branch * California Wildlife Conservation Board * California Wildlife Programs B ranch * California Work Opportunity and Responsibility to Kids (CalWORKs) * California Workers Compensation Appeals Board * California Workforce and Labor Development Agency * California Workforce Investment Board * California Youth Authority (CYA) * Central Valley Flood Protection Board * Center for California Studies * Colorado River Board of California * Counting California * Dental Board of California * Health Insurance Plan of California (PacAdvantage) * Humboldt State University * Jobs with the State of California * Judicial Council of California * Learn California * Library of California * Lieutenant Governors Commission for One California * Little Hoover Commission (on California State Government Organization and Economy) * Medical Board of California * Medi-Cal * Osteopathic Medical Board of California * Physical Therapy Board of California * Regents of the University of California * San Diego State University * San Francisco State University * San Jose State Univer sity * Santa Monica Mountains Conservancy * State Bar of California * Supreme Court of California * Teach California * University of California * University of California, Berkeley * University of California, Davis * University of California, Hastings College of the Law * University of California, Irvine * University of California, Los Angeles * University of California, Merced * University of California, Riverside * University of California, San Diego * University of California, San Francisco * University of California, Santa Barbara * University of California, Santa Cruz * Veterans Home of California Our government says that the only places they can cut expenses is Police and Fire....YEAH RIGHT!!! It doesn't matter whether you are a Democrat, a Republican or Independent. This list is shocking. Over the years, our politicians have created this enormous pork barrel of agencies that employ over 350,000 people directly and countless more via contracts with the State. All of these people get salaries, medical coverage and pensions at our expense and almost all are unionized. Take a good, close look. Unbelievable?............No...Believe it!!! Milton wrote about Satan's headquarters are called Pandemonium just like the intent of Occupy Wall Street. Video has visceral impact and intended or not, works it's way past our regular filters. Remember those powerful images of the future gone wrong with Bif in control in "Back to the Future II"! Ah, the good old days! I miss living in Portland. It's such a lively and fun place. Enjoy! James Cameron has released new CGI of the Sinking of the Titanic and has brought it to us sponsored by National Geographic. Here's a novel way to store your books! It's difficult to watch the President talk about relieving pain at the pump for the millions of us who drive, because his statements are spoken in a condescending manner and have the effect of being divisive. Open discussion is not welcomed. Fortunately there are researchers who see through the smokescreen of erudite pomposity. Though seemingly simplistic with the plethora of educated discussion of world fuel complexity, personal conservation has become little more than an afterthought easily swept under the rug. Put simply, drive less and keep your car for a long time and in good shape and convince others to do the same, but keep the government out of your decision and away from others' personal decisions. Replacing your car with a fuel efficient model does nothing to save on the energy required to build that new car. The endless lawsuits playing out in the political world with payouts have all their costs filtered down to you and I filling our tanks. The truth is so much simpler and easier on the conscience. Thank you, Lou Dobbs! Transparent Mercedes: Covered with LEDs & Photographs Relayed From Behind! Watch and enjoy. My bet is this was done with a Canon 60D using a feature internal to the camera; just a hunch (I have one). The reality here is rather frightening. Robin Dobson is growing an ecologically balanced crop of grapes for his winery in Washington, on the edge of the Columbia Gorge. 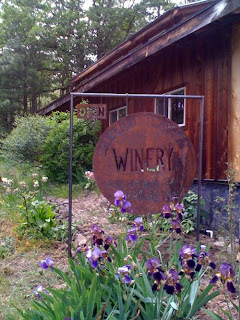 He chose the area he did for the myriad of micro climates available for a variety of grapes. Miraculously, water is only needed for the first three years after which the grapes fend for themselves. The winds, common to the Gorge, tend to keep the plants dormant. When the winds taper off in the evenings, the grapes come alive and it is during these times the plants grow. He has made a point of keeping native flora and fauna between the rows. I'm actually quite curious if the grasses slow the growth cycles of the grapes, and possibly act as fine tuning aspects to flavor. Also Robin mentions modest yields of a ton per acre. Knowing the Dobsons' intense command of plant biology, I'm looking forward to possibly having some of my questions answered as to the ameliorating aspects of such a natural ecosystem. Helio Collective Reel 2012 from Helio Collective on Vimeo. 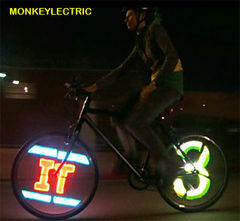 The Mini Monkey Light is a clever light show designed for safety and fun. 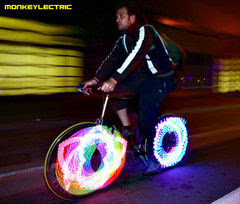 They are powered by batteries mounted to the hub of a bike wheel while the lights are attached to the spokes, spinning with the wheel and creating a programmable, and changing light show that is sure to turn heads. 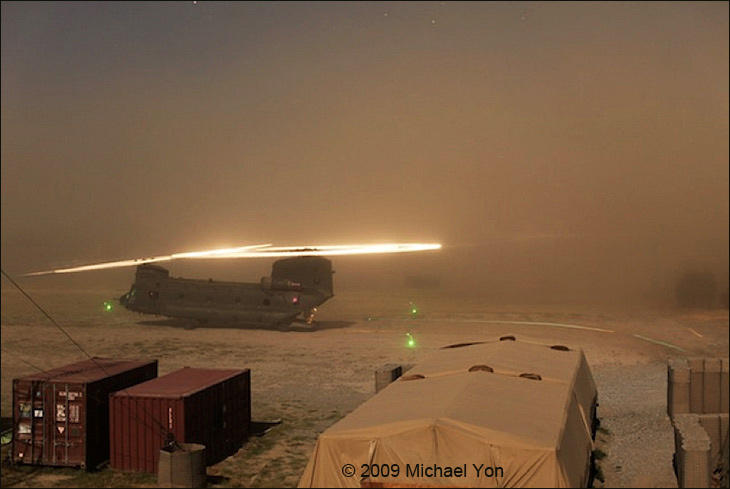 Michael Yon relentlessly fights bureaucratic red tape from the battlefields of Afghanistan. But, even so, he has time to see the beauty in a perilous place. Michael has captured a static electricity effect visible at night which is the result of dissimilar materials, in this case titanium/nickel helicopter blades moving through dusty air fast as the blades rotate. Yon, who made these shots with a Canon 5D Mark II with a 50 mm lens at an ISO of 800 mentions that longer time exposures reveal more colorful effects. Yon is currently cutting through bureaucratic red tape to enable medevac from other than Red Cross specific craft because they are unarmed. Lives are being lost while the wounded wait for Red Cross craft. Serbian Guitarist Ana Popovic Pushes It To The Limit; Oh Yeah. Timelapse+ intervalometer Features from Elijah Parker on Vimeo.